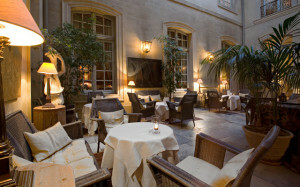 La Mirande, built in the 18th century and set in an old mansion at the foot of Palais des Papes in the heart of Avignon, this hotel provides a relaxing authentic experenice inviting you to explore the French lifestyle and landscape. The ancient walls of the hotel encourage you to learn and discover the history behind the hotel. Set in the heart of Avignon guests can experience true French lifestyle and can visit the city and experience it’s picturesque streets and buildings. Due to its convenient location guests have easy access to transport meaning that it is quick and simple to visit near-by towns and cities. With an onsite gourmet restaurant La Mirande creates a friendly environment with attentive staff generating a truly gastronomic experience in the warm and inviting setting of the Cardinalice room. A cooking school onsite gives guests the opportunity to cook traditional French cuisine and also get to experience cooking on a wood burning stove. A traditional garden placed onsite provides a quiet place away from the bustle of Avignon which suits all moods. Room ranges are from deluxe to suites, all however are decorated brightly and cheerfully giving visitors the opportunity to relax and unwind. Many of the rooms include large sized windows which provide stunning views of the high walls of Palais des Papes. 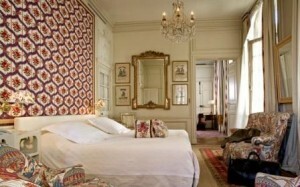 Despite being decorated with a vintage style the hotel still provides luxury comforts for a more homely feel.